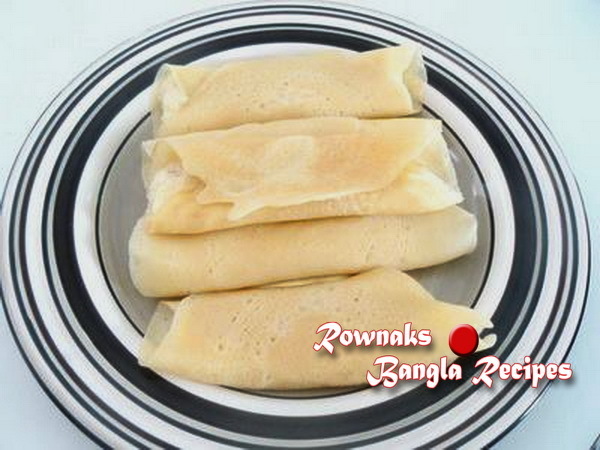 Patisapta /Kheer stuffed crepe is one of the most popular sweet snacks (Pitha) in Bangladesh. Patisapta is basically crepe stuffed with thicken milk. Patisapta even can make with coconut stuffing but Kheer/rabri one is the best. You can use jaggery(gur) but I think that sugar gives better texture for this. If you use jaggery(gur), you dont use cardamom powder. 1. Heat the pan (non-stick preferable) with milk, cardamom and rice flour. 2. Cook it till it becomes thick paste constancy. Need to stir constantly. 3. Add the sugar and stir it. 4. When sugar melts, turn off the heat and keep it aside. 5. Make the batter to mix all ingredients and water. Butter will be neither too thick nor too watery. 6. Heat the pan (non-stick preferable) and add 2-3 drops of oil. Take a paper tissue and spread oil with that. 7. Take 1/4 cup of batter (vary how big or small you want) and spread it evenly on pan (actually moving the pan in circle motion). Cook it under close lid about 1 minute. 8. Place the filling (kheer/ rabri) lengthwise at oneside of the crepe. 9. Fold the crepe and when the crepe is cooked , remove it from the pan. Repeat this process with rest of batter and filling. 10. Serve Patisapta hot or chilled because both have differ taste. Most welcome. Patisapta is my fav too with full of kheer.. heavenly..
hello… i tried using this recipe yesterday. my mistake was i only read the english version. It was awful! Now i read the bangla version and find out rice flour is supposed to be 1cup! In the english version u said 3 cups!! What a waste! Please review your recipe after u type it. Please amake janiyen kemno holo.